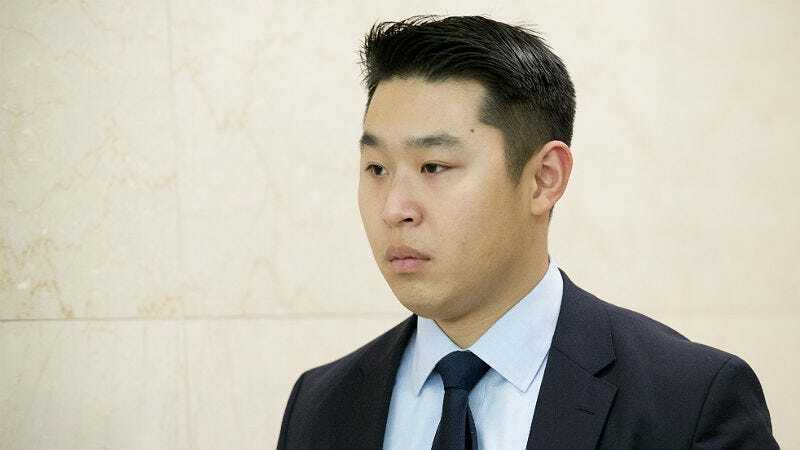 In Brooklyn, a jury has begun deliberation in the trial of police officer Peter Liang, who fatally shot unarmed Akai Gurley in a housing project stairwell in 2014. Two years ago, Liang was patrolling a stairwell in Brooklyn’s Pink house projects with his gun drawn when he says he heard a noise and let off a shot. His bullet ricocheted off a wall and hit Gurley in the heart and liver. On Monday, Liang testified that he didn’t initially know someone was shot and spent the first moments arguing with his partner over whether to call in the loose fire because he was scared to lose his job. Later, when he began looking for the bullet with his flashlight, he heard Gurley’s girlfriend Melissa Butler crying and saw the bloody body. As Butler tried to administer CPR on her boyfriend, Liang didn’t help. He called for an ambulance, he says, because “he thought it would be better to wait for professional aid.” Gurley’s mother had choice words for his response outside of the court room this week. “Not everyone has the luxury of living a doorman building, the defendant would have you believe the Pink Houses is full of criminals,” Alexis said. Defense attorney Robert Brown argued that patrolling the stairwell with a gun was “unofficial standard operating procedure,” and that Liang hadn’t been trained to perform CPR. If convicted, Liang faces up to 15 years in prison.